Yes, yes! I have been on a blogging spree. When I make something exciting I can't wait another week to share it with you! Today's salad is very reminiscent of kind of dinners I'm eating lately. But before that I have to tell you that the baby spinach and rosemary is from my tiniest balcony garden. And what a joy it is, snipping fresh leaves for your salads. Spinach has been by far the easiest thing to grow with little or no attention. But I'm also devastated that my bok choy went into the pigeon's belly instead of ours. I must be the last person or at least the last food blogger to taste quinoa which was sometime around last year. 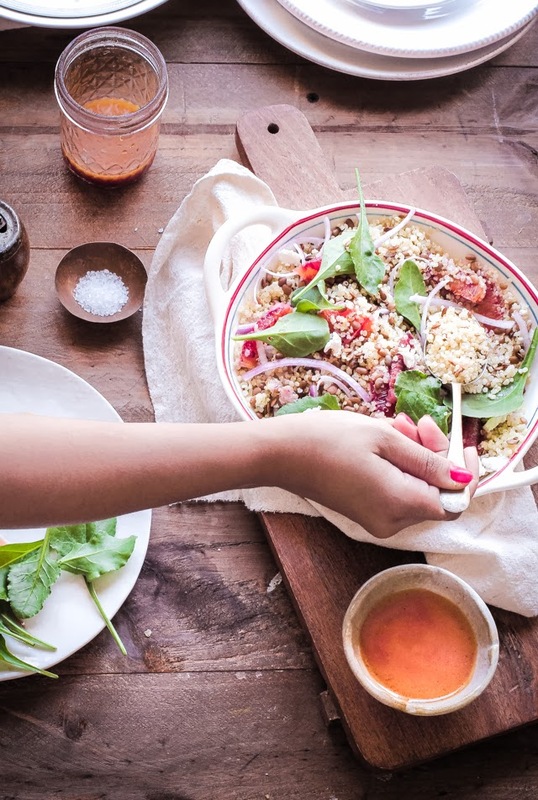 I might have had an occasional bite or two at a restaurant but never quite replaced my bowl of rice with quinoa just because it has been trending. Did I tell you I'm very rebellious when it comes to trends? I rather stick with balance and moderation. Thank you! I usually make this salad with lemon juice but since blood oranges are in season, they made a great addition. The colour and sweetness balances puy lentil's dark earthiness and the citrus dressing is more like a soup you want to drown your quinoa in. Also, M thinks this salad deserves a lot of pepper. But it would be just him trying to run away from tasting quinoa, I can't be sure. *If goat cheese isn't your thing, this salad is good with feta cheese too. Cook the quinoa in two cups boiling water until tender for about 12 minutes. Drain well and let it cool. Whisk the dressing ingredients until creamy and pale. Alternatively shake it in a mason jar. Toss all the ingredients for the salad and dressing together. Serve immediately. Alternatively, chill the salad but add the dressing, blood orange segments and onions when ready to serve. A beautiful salad! Those flavors are just fabulous. I love everything about this recipe. 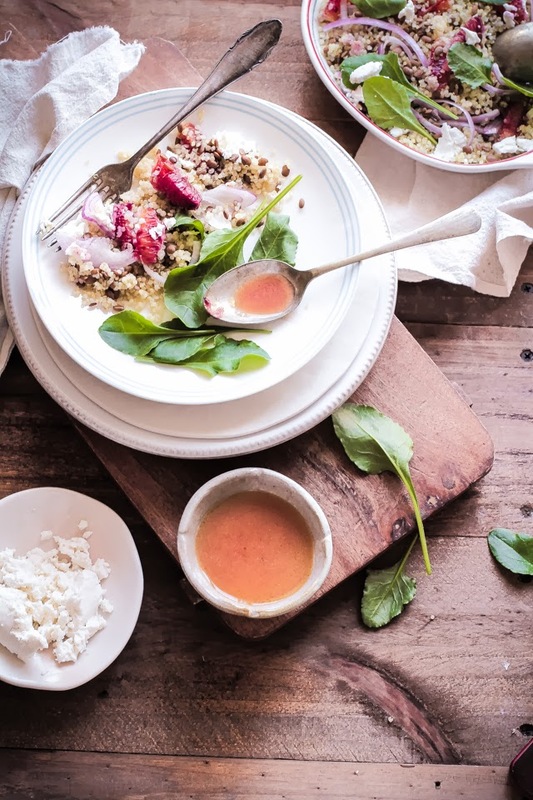 I am a bit like you when it comes to trends ;) I like to cook/eat local food so wasn't too interested in buying expensive imported quinoa just to blog! 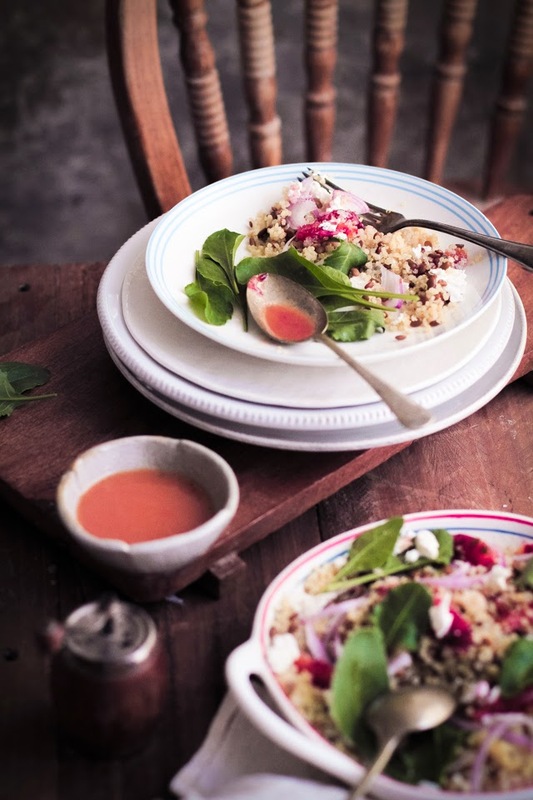 So you are not the last food blogger to blog a quinoa recipe. Picture of health.....your salad looks so exciting with all those colours. Must try someday. i jumped into quinoa bandwagon when it started and have been loving it since..however, it takes me a while to get into treads otherwise. this salad is just perfect. Wonderful salad. What fabulous flavours. Congratulations on your balcony harvest! I am an office farmer of radish sprouts. SOOO much fun! Love this recipe and the use of the blood orange. Putting it into rotation soon. I love the sound of this salad. It's super gorgeous too! Love salads with lentils. I am not much of a quinoa person myself so no matter how much its trending I can't eat it all by itself. Just try to sneak it wherever possible knowing what a superfood it is! That is one yum sounding citrus dressing! I'm rebellious when it comes to trends to, but when I did finally try quinoa I fell in love with it. Sometimes trends can be a good thing. :) Gorgeous images, as always Kulsum. Mmm... love all the layers and flavors in this salad. Can't live without quinoa. This is my kind of salad. What a great combination. Love your pics! Oh that dressing! I must make that immediately.